Professionals in the dairy industry who want to learn about problems on dairy farms that result from mastitis now have the opportunity to take an online course at their convenience offered by Penn State Extension. "Best Milking Practices" is a self-paced course primarily designed for dairy producers, employees and managers that teaches concepts to help them measure and reduce levels of mastitis, and it offers practical solutions to help apply that knowledge to milking practices. 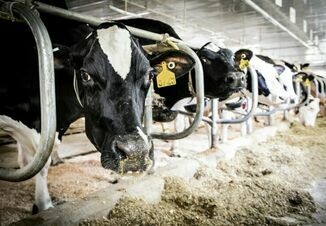 Mastitis is a common and expensive problem on dairy farms. It is, on average, costlier than veterinary care, food, housing or equipment maintenance. To maximize a dairy's profitability, it's important for producers to learn as much about mastitis as possible to reduce or eliminate the spread of it on their farm. The course includes eight sections: Mastitis Basics, Cleanliness, Handling Cows, Pre-milking Prep, Milking and Post-milking, Managing Infection, CMT and On-farm Culturing, and Standard Operating Procedures. At the end of this course, participants will be able to understand the importance of early detection of clinical mastitis; increase knowledge about cleanliness and SCC; recognize the importance of consistency in preventing clinical mastitis; understand the relationship between milk let-down and oxytocin vs. adrenaline; and develop a standard milking procedure that has a lag time of 60-90 seconds. Participants also will be able to implement best milking practices using the strip cup, pre-stripping, milking gloves, and the CMT test; gain a better understanding of on-farm culturing and its usefulness; and recognize the importance of developing standard operating procedures. "This course will help to increase productivity and profitability on dairies that participate,” said Amber Yutzy, a dairy herd health educator in Huntingdon County, who specializes in dairy cattle milk quality and udder health. “We will cover the different causes of and types of mastitis, how you can better prevent mastitis, equipment types and use for avoiding mastitis, and the importance of early detection of clinical mastitis." Additionally, participants will learn about the importance of reduced antibiotic use to treat mastitis, how to properly implement an on-farm mastitis culturing program, how to accurately identify bacteria and how to make educated treatment decisions to aid in increasing profitability. "Participants can put all of this information together and learn how to come up with a standard operating procedure list that is tailored to their farm," Yutzy said. "By the end of this course, participants will understand the importance of proper milking procedure, become familiar with how to perform a CMT test, appreciate the importance of consistency in cow treatment, recognize different bacteria that cause mastitis, and be comfortable with on-farm culturing." Register for the course at https://extension-dev.psu.edu/best-milking-practices. A variety of online non-credit courses for the public have recently been unveiled on Penn State Extension's new website, which provides a wealth of educational experiences and resources for the professionals and community members served by extension. The new web experience allows consumers to access educational articles, videos, online courses and publications at their convenience, and register for regional in-person workshops and online webinars on a variety of subjects.